40+ Style » What I wore » Are you ready for the white dressing challenge? My love affair with both white and red continues. When I don’t know what to wear, it is one of my go-to combinations. Remember this top? It’s business in the front, party in the back! This striped blouse is a new edition in the red family of my closet. I love the versatility of it. Tuck it in for a nice business kind of look and leave it out for a casual look to wear with white sneakers. Of course it would have been nice if the collar was a bit neater for these photographs! As usual I’m keeping things simple (and cool) and play with my accessories, and this time also nails, to make the whole outfit more interesting. My belt is always a good option as well as my watch. Will you be participating in the upcoming white dressing challenge? Show us all how you are rocking your whites! I will give you a few more days to submit your entries until Friday. Live fashion show this Wednesday! Also, save the date! On this coming Wednesday 29 May there is going to be another fashion show at the WHOA network featuring yours truly and 3 other fashionistas! It’s live at 7pm US Est (29th), 7 am Singapore time (30th) and all of you in Europe have to stay up until 1 am! Join us on Google plus and let us know that you will be coming here. For more information, you can also read this page. Hope you join me! Have you worn white yet this year? I love both looks for you and the beautiful accessories. You look great in red and white! Love red and white–and really love those red sandles! Both are great looks Sylvia. I like both of them equally! I really like how you kept both looks so simple & chic! and wow – the details down to your fun nails. I can’t wait what all the fabulous ladies will come up with! The red top is so pretty and unique. It looks great with your white pants. Hi Sylvia, love all these choices. Great accessories in the first look. You are looking lovely. I think it is such a becoming palette for a blond woman. 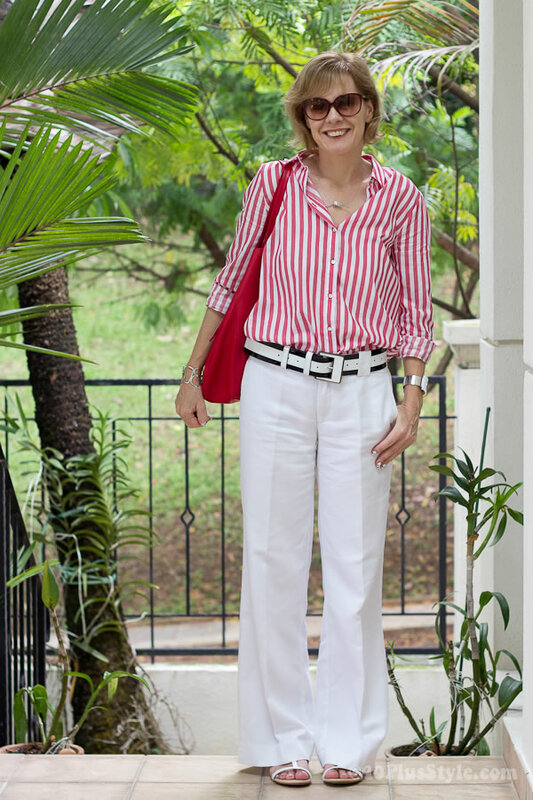 Great minds think alike– I did a red and white post today! The closest I would get it pink and cream/ecru. I tend to softer colors. Your red top is fantastic! Wow, what a coincidence! I am wearing white and red too 🙂 You truly rock this color combo and I love the stripes and pants look the most! Love the white and red Sylvia. You’ve inspired me. I might just explore my closets and see what I can come up with! What could be better than a top that’s business at the front and party at the back? Love the red and white combos. Very fresh and summery! Your nails are incredible! Hand-painted nail art or the stick-on kind? They’re SO cool. This is one of my favourite tops. Well your top, but one of my favourite. I adore red. Such a nice colour. Looking good in both looks. And there is the belt again (sigh with envy). I know what you mean with the collar never doing what you want it to do. Like stay ! Of both looks I prefer the first. Somehow it looks more clean and modern. Perhaps because of the skinny trousers? But as I say, the latter is good too. thanks Greetje. I am looking out for you…. Its very interesting fashion blog. Especially I am reaching my 40 in few years time. Will follow your blog. thanks for sharing. Both looks are fabulous, Sylvia! I particularly love the flirst one – gorgeous back of your top and your red sandals. They just have the perfect heel. Previous post: Looking good? But are you feeling great?